Previously I had run pfSense as my firewall / router on a discarded Celeron 700mhz machine, with a lot of spare NICs in the PCI slots. Browsing around the local Goodwill and I stumbled upon this Watchguard Firebox X500 for $10. Finally, real rackmount gear for my 2×4 server rack! I’m sure whatever software comes on this thing is great and wonderful, but I didn’t even try to use it. 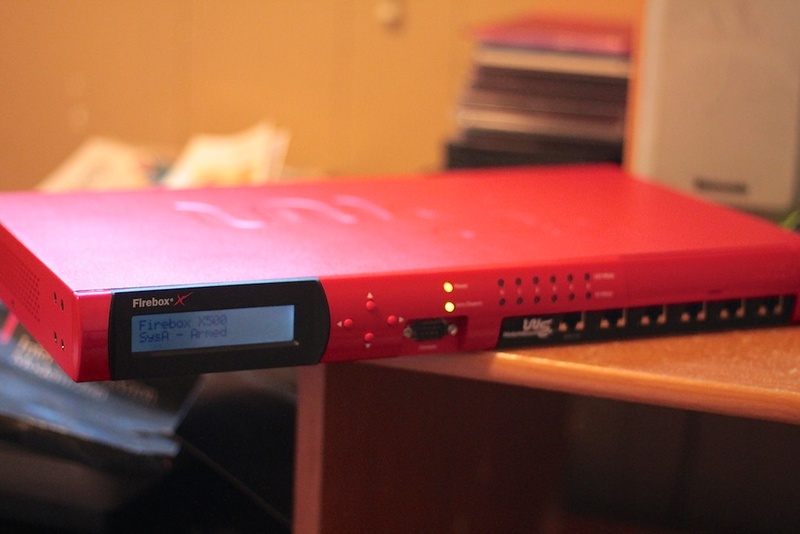 First step if you have one of these – hop on over to the pfSense Firebox wiki page and do some research. Popped open the case, swapped in a 2gb CF card with the pfSense no-VGA embedded image, and set to configuring it. The most difficult part of all this was getting a USB to Serial cable that worked… and then a Null Modem cable… and then having to do the configuration in a virtualized Windows XP machine because there are no OSX drivers for the WCH341 chip in my cheap eBay usb-serial converter. Now that it’s all set up I can easily access via ssh or http, so serial access isn’t as important. The hardware in this is just a 1.2ghz Celeron, with 10/100 Ethernet ports and some 256mb RAM. Obsolete, yes, but that red paint job never goes out of style. This entry was posted in Hardware on November 22, 2014 by admin.